Heartland Designs is a consortium of professional craft workers based in Co Offaly and dedicated to promoting excellence and originality in arts and crafts in the Irish Midlands. All Heartland Designs members welcome commissions, and take pride in custom-designing pieces to suit individual clients’ needs. Renowned for their heritage and folklore, culture and tradition, the counties of Cavan and Monaghan have a strong sense of their own identity and are truly a world apart. Its friendly people and magnificent landscape only add to their special charm. 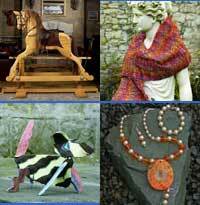 From jewellery and ceramics to artwork and photography, there’s a stunning array of arts and crafts, some traditional, others contemporary. Aclint Art Forum is a group of local artists in the West Louth area of Ireland. 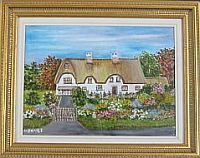 This group exhibit their art annually and have enjoyed great success. Aclints artists paint in oils, watercolours and acrylics and mainly cover landscape, architecture, animals and still life.